Your gums play a vital role not just to your oral health, but to the health of your entire body. So much so that diseased gums can invade your entire system with illness and even threaten your heart. Just in case keeping a full, white set of attractive teeth wasn’t enough of an incentive to diligently maintain your oral health routine, protecting your heart is an additional perk. If you want straight, strong, white teeth, you actually need to pay just as much attention to your gums. If your teeth lack a healthy and stable foundation, they will suffer the adverse effects of inflammation and decay. In fact, severely irritated and inflamed gums can become so destroyed by bacteria that your teeth will require extraction or even fall out on their own. Gingivitis is the first stage of gum disease that is triggered by plaque – a sticky substance filled with bacteria – building up under and along the gum line. Fortunately, gingivitis can be easily reversed with improved brushing and flossing habits. 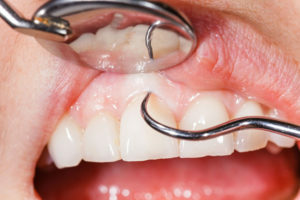 However, if gingivitis is not resolved, it will advance into a more serious version of gum disease called periodontitis. This final stage of gum disease is marked by the chronic presence of plaque, tartar, and bacterial infections along the gum. It eventually destroys the gum tissue and underlying bone structure that is needed to support the teeth. The gums inside of the mouth are full of blood vessels, and the mouth itself is filled with bacteria. When unhealthy gums become inflamed, the bacteria in the mouth can seep into the bloodstream and travel anywhere within the body. This creates dangerous inflammation that threatens the heart. Inflammation causes hardened arteries, which makes it difficult for blood to flow to the heart. Atherosclerosis dramatically increases a person’s risk for heart attack and stroke. When the inflammation of atherosclerosis combines with the inflammation and roaming bacteria caused by gum disease, the results could prove fatal. Doctors can actually link certain types of bacteria with periodontal disease, including Streptococcus sanguis. It is far more common for people with gum disease to have Streptococcus sanguis bacteria in their hearts, which highlights the connection between the heart and the mouth. The first step to maintaining your gum health is to visit a prosthodontist like Dr. Tadros, DDS at Dental Implant Solutionz in Largo, Florida. Dr. Tadros specializes in laser dentistry and other procedures that can restore your gum health and protect the rest of your body. Call (727) 202-4926 now to make your appointment.